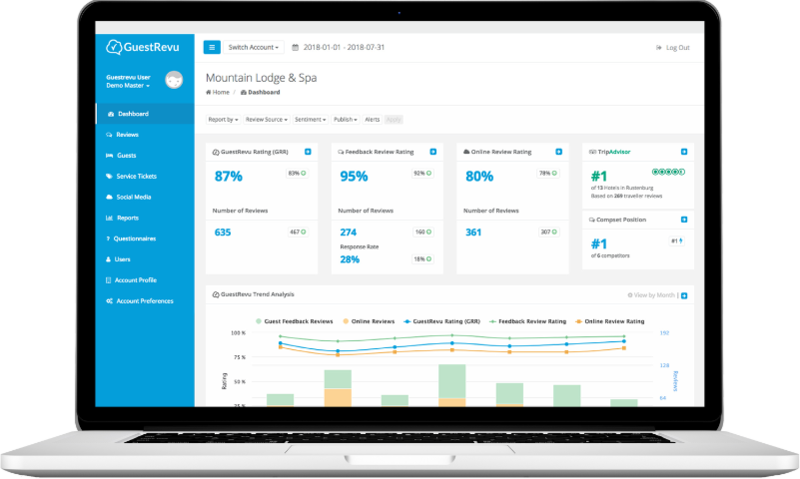 GuestRevu surveys help establishments get insight from customised, branded surveys and proactively drives reviews to TripAdvisor and Google to improve rankings. The best part of direct feedback is that you have a chance to resolve any potentially harmful situations before they become reviews on public platforms. By providing your guests with the opportunity to address concerns with you directly, they will often feel that their feedback is being taken to heart, and feel less inclined to vent on social platforms like Facebook and TripAdvisor. Another great benefit is that you can fix problems when you get direct feedback. As they say — prevention is better than cure. Save time and know what your guests are saying about you publicly by having all your online reviews collected and analysed in your GuestRevu dashboard. Our integration to GuestRevu is automated so all you need to do is add your guests and their email addresses in ResRequest and GuestRevu will do the rest. For more info on this marketing tool, see our Guest Survey guide. Sign up with GuestRevu here and GuestRevu and ResRequest consultants will be in touch to get you set up. A once-off ResRequest setup fee of approximately 1 hour is billed at our standard data set up rate, but if you sign up before 30 June 2019 we’ll do the set up for FREE! New scam alert! Are you connected to your buyers?